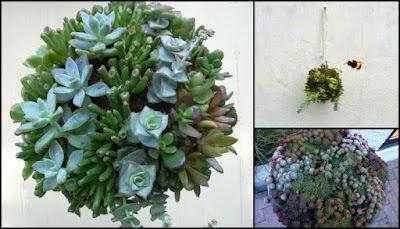 I just fell in love with these succulent garden balls when I saw them! 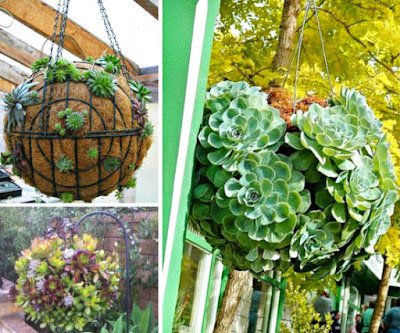 I can just picture them hanging and swaying around the patio. It's that time of year again along the Gulf Coast of Texas: Pear Season! We've gotten baskets and baskets full of nice hard Keifer pears from my dad's neighbors which we've made into delicious pies. We've made 8 so far. Two for eating now and six to save for the rest of the year. If baking immediately preheat oven to 450 degrees. Combine sugar, flour, cinnamon, salt, and lemon zest in a bowl. Place pear slices in layers in the pan, sprinkling the sugar/flour mixture over each layer until you reach the top of the pie pan. Cut butter into little bits to drop onto the top of the pie. Sprinkle with lemon juice. 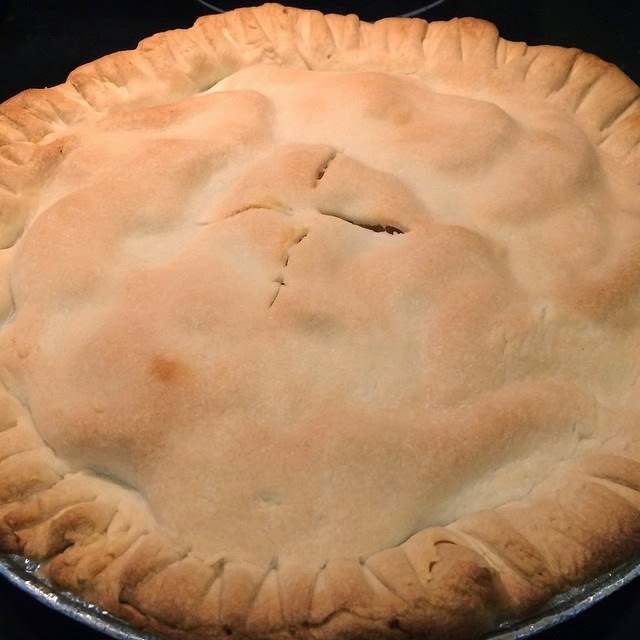 Place the 2nd pie crust across the top of the pie. Roll up edges and press down with fork around the perimeter. Cut slits in the top of the crust. If baking immediately place into oven for 10-15 minutes. Lower the temperature to 350 degrees for 35-45 minutes, until the crust is golden brown. If freezing, place into freezer. Once frozen, remove from freezer and take pie pan from pie. 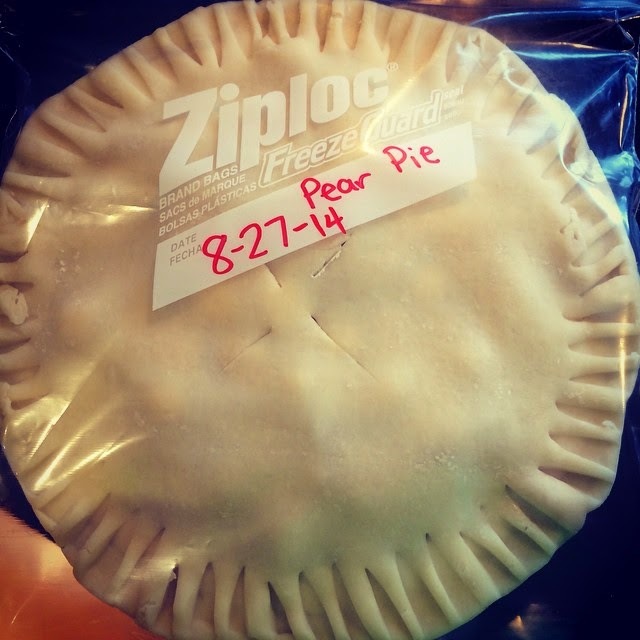 Place the pie into a labeled freezer bag. Place pie back into freezer. Bake and eat within a year. Note on Ingredients : I personally source out the 'cleanest' foods because we are healthy-conscious folk. 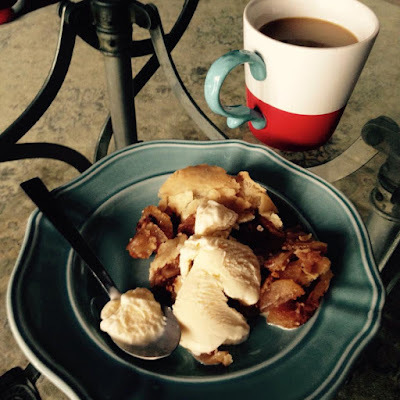 I am not paid any endorsements for the products I have recommended in this post/recipe. The products I have used in this recipe are personal preferences and have rendered the most accurate final product. The bottom of this post will list the products I have used and where you can buy them. Make the Marshmallow tea by steeping & covering 1 Tsp of Marshmallow root in 1 cup of boiling water for 5 minutes. Once it is done steeping, divide the marshmallow tea into 1/2 c portions. While the marshmallow tea is steeping or after it has steeped, prep the 8X8 baking pan. Cut two sheets of parchment paper that fit the inside width of the pan and allow an overhang on the other width of the pan. Grease the bottom & sides of pan with coconut oil. Place your first parchment sheet in the pan and grease the top to allow the second sheet to 'stick' into place. Leaving the overhang of the parchment paper will help you remove your finished marshmallows if desired. Add the 3 Tbs of beef powdered gelatin to your mixer with 1/2c of the marshmallow tea. Briefly mix with your spatula. Next, add the other 1/2c of marshmallow root tea, maple syrup, vanilla extract and sea salt to the saucepan. Turn the burner onto medium high heat and bring it to a steady boil. Do not stir the mixture while it boils. If you have a candy thermometer place this in the saucepan as well. The desired temperature to reach is 240 degrees Fahrenheit. If you do not have a candy thermometer, gather your glass small cup/bowl with ice water. When the mixture has boiled for several minutes you can check it periodically by placing a small drop amount into the ice water. When it gels or hardens up in the ice water without sinking to the bottom immediately in its liquid state, then it means your mixture has reached the desired temperature. Please note the picture where your mixture should reach a steady bubbly boil. When your mixture is ready, turn on your mixer to LOW and steadily and slowly add the hot mixture to the mixer bowl. Once it is fully incorporated, turn your mixer on high. You want the marshmallow mixture to be stiff and not runny but, you do not want to over mix it because it will harden up before you can even transfer it to smooth it out in your pan. A lot of recipes say 10 minutes or more, but I personally like it around 7 minutes to leave the mixture a tiny bit under stiff to allow me more working time to spread it out in the pan. Note the pictures below showing the progression of color changes. This took place over 7-8 minutes. The picture below shows that it is still slightly runny so I mixed it for one more minute. The picture below shows that it is ready to be transferred to the pan. Transfer your marshmallow mix to the pan as quickly as you can before it gets unworkable & spread evenly with a silicone spatula. Using wooden utensils will only make a sticky mess. I like to refrigerate immediately after transferring to the pan. The marshmallow will set up quicker and you can eat it sooner. We leave the marshmallows in the refrigerator for an hour before we cut them into square servings. My helper likes to clean the dishes while we wait for the marshmallows to set up. To make it easier to cut into the marshmallows sticky, gooey goodness...I recommend sliding a clean butter knife into a jar of coconut oil before you cut into the marshmallows. Reapply oil as needed. Beef Gelatin Powder : Vital Proteins http://www.vitalproteins.com or I buy it from Amazon or Vitacost.com whichever is the cheapest at the time I buy including discounts/coupons. Vanilla Extract : Central Market ( is a brand from my local H.E.B. grocery store) or I buy another brand called FRONTIER www.frontiercoop.com OR make your own. Sea Salt : Celtic Sea Salt ( I buy from Vitacost.com or for large quantities I will buy from a coop called Azure Standard https://www.azurestandard.com). Coconut Oil : I usually buy large quantities so I try to get it as cheap as I can - Azure Standard https://www.azurestandard.com is a good coop place to buy from as well as Tropical Traditions http://www.tropicaltraditions.com/virgin_coconut_oil.htm or Wilderness Family Naturals https://www.azurestandard.com. It's that time of year! 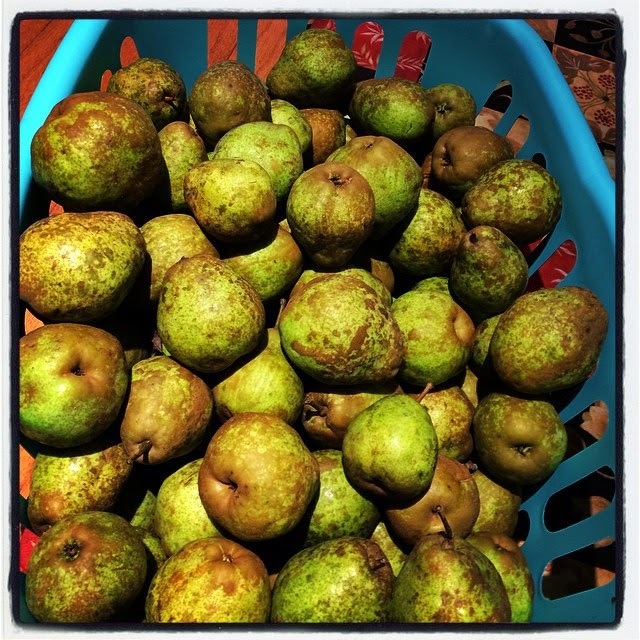 Pear Season! 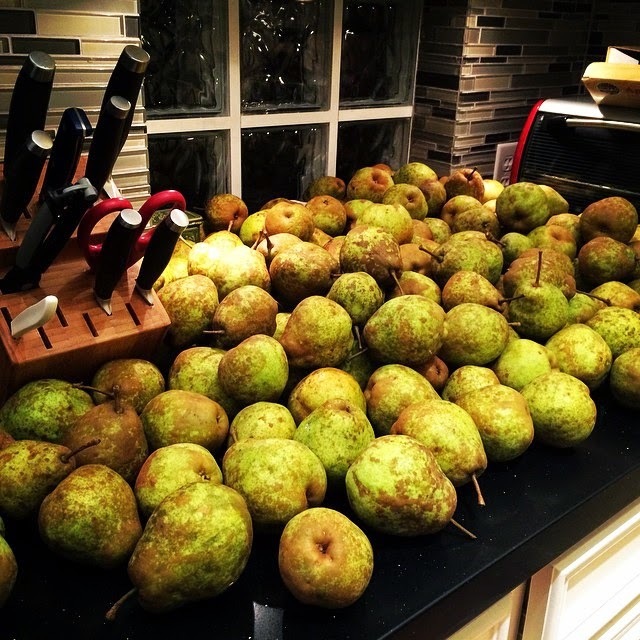 Neither my pear tree, nor my dad's, produced much this year, BUT my dad's neighbors', The Moore's, tree produced hundreds and hundreds. They were kind enough to let me have a lot of them. 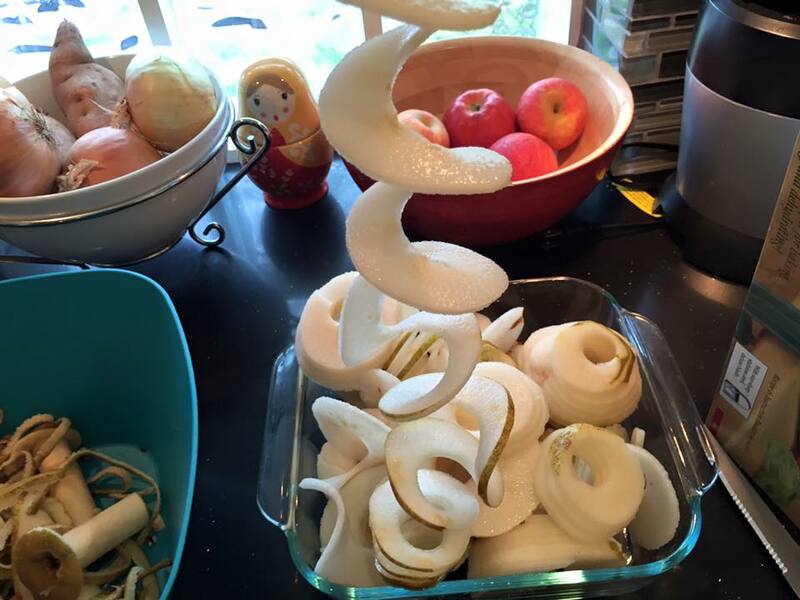 A few years ago I made pear pies and froze them. We then had pear pie at every holiday and occasion that came up. When they were gone I was so sad…so sad. So when the opportunity to restock the freezer arose, I jumped at it! 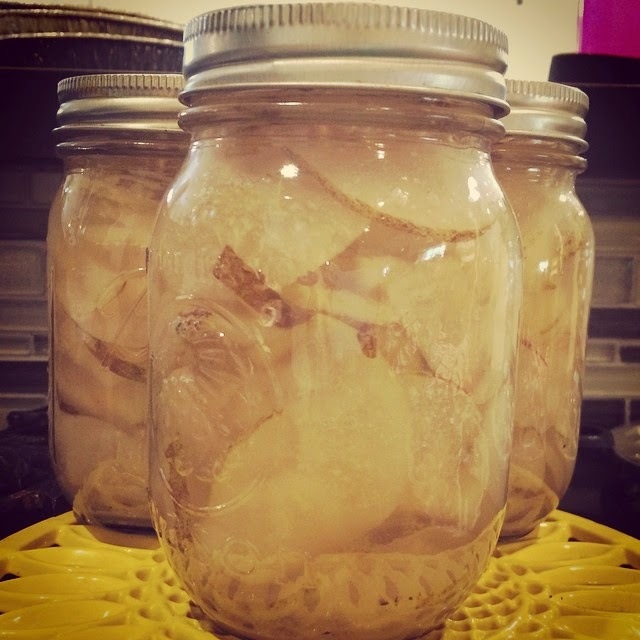 I also tried my hand at making pear jam and pear preserves. YUM! I'll have the recipes for all coming up soon. Howdy! 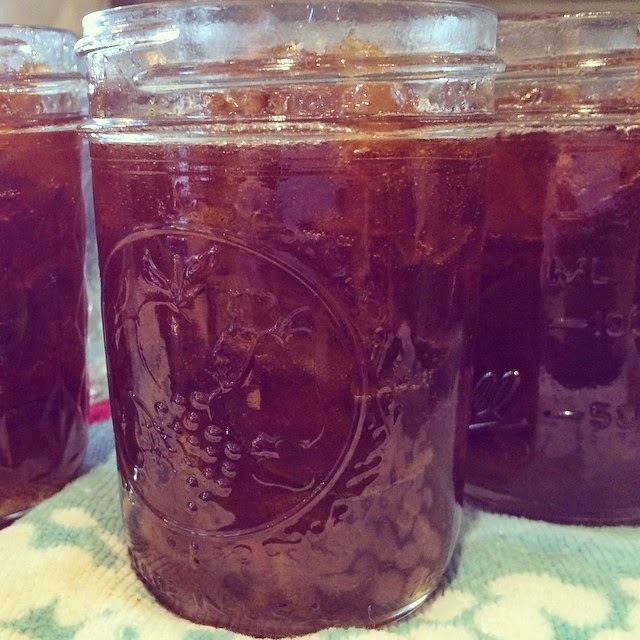 Welcome to the Awesome Farm Fashion Giveaway on Earthworms and Marmalade!! You don't have to buy the farm to have great farm fashion. Whether your style has a splash of English country or veers down that American farm road, one lucky winner will win some green to enhance their farm fashion wardrobe!